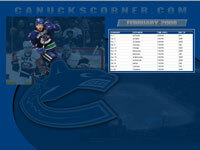 February's wallpaper has been posted and features Daniel Sedin as well as the monthly schedule. Thanks Brian, very appreciated. Already put it on my desktop. thanks brian. maybe this will turn the team around. see what happens when we miss a wallpaper. the team goes to shite. i'm totally refusing using this, ...damn demons.